Now, more details on this little cake. I based it off of a recipe called "chocolate toffee crunch cake" in the book, Chocolate Cakes. I decided to call mine a torte after the adjustments I made and seeing how the cake turned out. The original recipe starts with a chocolate-almond sponge cake baked in a tube pan. The cake is then spliced into 3 layers, each brushed with amaretto syrup. It's then filled and coated with chocolate ganache and finally, toped with toffee candy. I took a lot of that premise but made a number of changes. First, I scaled the recipe down by half and baked the cake in a 6x3 inch round cake pan instead of a large tube pan. I now understand the wisdom of baking this cake in a tube pan if you plan to slice and fill it. A tube pan allows for quicker and more even baking throughout. Baking it like I did in a normal cake pan, I found it really important to make sure the cake is set throughout - i.e., the center is well baked and not still wet in any way. To that end, give it an extra minute or two and make sure the entire cake is fully dry and set. Mine could have used an extra couple of minutes to firm up the center more. I went with just two layers so I split my cake into halves. The amaretto syrup is a simple mixture of sugar syrup with some amaretto liqueur stirred in. A syrup like this is just what a sponge cake welcomes; it fairly soaks it up like it was waiting for it. For the ganache filling and frosting, I made a water-based one. Last year, for the blog's 4th anniversary, I made a pistachio-orange chocolate cake where I used a water ganache then as well; that cake is one of the favorites I've ever made. When it comes to the ganache, a water based one is convenient to make and it allows the flavor of the chocolate to shine. My family and I enjoyed this little anniversary cake. Before digging in, I think you expect a very rich, dense cake but it turns out to be rather light thanks to the sponge cake. The amaretto syrup definitely helps add moisture and contributes flavor you clearly taste. The richness in the ganache is a great balance to the lightness of the sponge while the crunchy topping adds another dimension. Overall, I was happy with how my little anniversary cake turned out. I do love a good anniversary for an excuse to make and enjoy cake with loved ones! Thank you and continued happy cooking, baking, eating, and sharing to us all! * I made quite a few changes to the original recipe, scaling it down to a two-layer 6-inch round cake from a three-layer 10-inch cake baked in a tube pan. I use a water-based ganache. The result is a rich yet light chocolate-almond sponge cake, with a bit of crunch from the exterior coating of almonds and toffee bits. Bake cake: Preheat oven to 350 degrees with a rack in the middle position. Butter a 6x3 inch round cake pan and line the bottom with a round of parchment paper, greasing the paper (if your cake pan is not at least 3 inches tall, you can divide the batter and bake them in two 6-inch cake pans; adjust the bake time and checking for doneness when the cakes are fully set and a toothpick inserted in the center comes out clean). Sift cake flour, cocoa, and salt in a bowl and set aside. In the bowl of a stand mixer fitted with the paddle attachment, beat egg yolks and 1/4 cup of the sugar until thickened and mixture is a light cream color, about 3 minutes. Scrape the sides and bottom of the bowl, as needed. Mix in the espresso powder, vanilla and almond extracts. Using another clean bowl and the whisk attachment of the stand mixer, beat egg whites with cream of tartar on low-speed until foamy. On medium speed, beat egg whites until shiny and smooth and soft peaks begin to form. Gradually add the remaining 1/4 cup of sugar, a tablespoon or so at a time, until shiny stiff peaks form. Take about one-third of the beaten egg whites and fold it into the yolk mixture. Fold in the remaining whites. In three additions, sprinkle the flour mixture over the egg mixture, folding and incorporated each addition before following with the next. Scrape batter into the prepared cake pan and gently smooth out the top. Bake until the cake is set throughout, feels firm to the touch, and a toothpick inserted into the center comes out completely clean, about 20-22 minutes. If in doubt, give it an extra minute or two; it's important to make sure the center is fully cooked and not "wet" at all so the cake can be easily sliced later. Let cake cool in pan on a wire rack for about 15 minutes before running a knife around the edges and inverting it onto the rack to cool completely. Make amaretto syrup: Place boiling water into a 1-cup measuring cup. Stir in the sugar and mix until sugar is fully dissolved. Stir in the amaretto and set aside. Make chocolate ganache: Place chocolate into a heatproof bowl. Pour boiling water over the top and let sit for 1 minute. Then, gently whisk mixture until chocolate is melted and mixture is smooth. Let sit at room temperature, stirring occasionally, until thickened enough to spread (you can speed up the process by placing it in the refrigerator and stirring occasionally but don't forget about it since it can go from too loose to too thick very quickly). Assemble cake/torte: Place cake, bottom side up, onto a cake stand or serving plate. Tuck stripes of wax paper under the bottom of the cake for easy clean up. Using a serrated knife, slice the cake across into 2 even layers. Remove the top layer. Using a pastry brush, lightly brush the top of each layer with the amaretto syrup. Place about 1/3 cup or so of the ganache on top of the bottom cake layer and spread evenly. Top with second layer of cake (I soaked both sides of this top layer with syrup) and spread the remaining ganache over the top and around the sides of the cake. 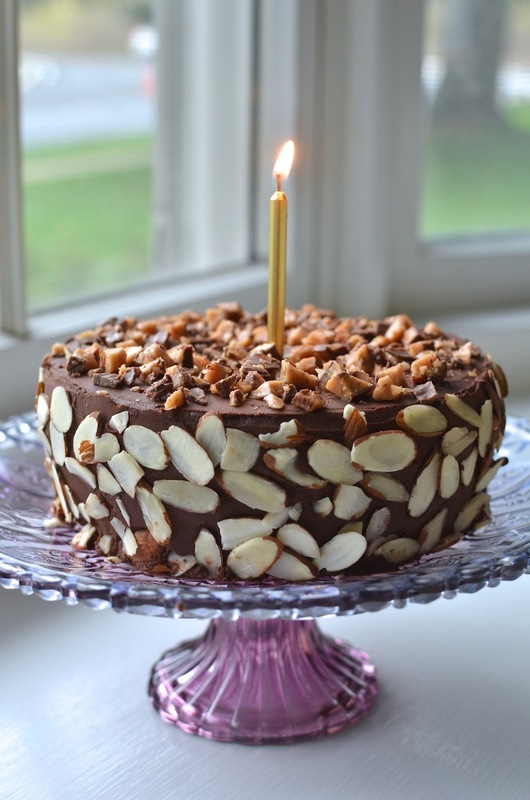 Use your hands and pat on handfuls of almond slices around the sides of the cake. Top the cake with toffee pieces, gently pressing them into the ganache. Remove the wax paper strips under the cake. The cake can be covered and refrigerated for up to 3 days. Bring to room temperature before serving. Wow! 5 years...congratulations my friend. It has been a pleasure meeting you. You always make my favourite things and make them so well. I have a feeling that if we lived closer, I'd be at your doorstep frequently:-) The chocolate almond torte is gorgeous. Here's to many more years of delicious recipes and posts. Hi Sonali - yes, hard to believe but I'm just still plugging away quietly here. : ) Thank you for all your kind words and for taking the time to visit. I love seeing your artistry over at your blog and I'm so glad I got to know you a bit. Thank you. Congratulations Monica! I can truly and honestly say I enjoy each and every visit with you so thanks for always making me smile, and for every single honest review and evaluation of the recipes and processes. I love the way you bake and experiment and I have been inspired weekly to try new ingredients (chestnut cream!) and to bake more cakes for sure. I love hearing about your family and life in Jersey :) I am honored each time you come and visit me and appreciate all your lovely written comments and compliments. This cake is fantastic and I want some 6" pans!!!! Tricia, I think I might cry! Thank *you* for your generosity. You have always been so kind with all the encouragement and I truly appreciate it. Yay for 5 years!! I am so glad you are still here plugging away :) I've loved getting to know you these last few years! And I'm with you Trisha - you have definitely pushed me to try new things like chestnut cream! I probably wouldn't have even known what it was until you talked about it!! haha Happy happy weekend Monica!! Hi Bobbi - the commenting is working! : ) Thank you for your kind comments. I so enjoy visiting your blog and seeing your creative, healthy recipes. I learn so much! And I get a taste of HK living again by reading your posts. Nice bonus, for sure! Congratulations!!! The torte looks incredibly beautiful and delicious! Wow, five years is such a milestone! 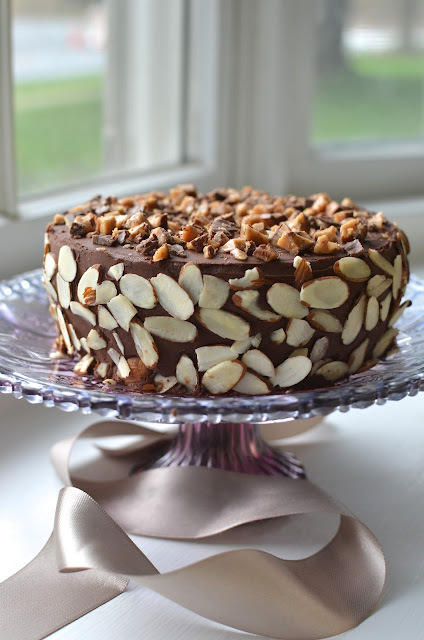 This torte is absolutely stunning- love the flavors and presentation with the sliced almonds. Congratulations on all your blog success and all that you've gained through blogging- I'm so excited to continue to follow your delicious adventures :) Pinning! Hi Monica, yea, 5 years thats a quite an accomplishment. Love all the works of art that come out of your kitchen, you are a great baker and cook. Hi Cheri, I'm so lucky to have the time to indulge in this hobby the last five years. You are too kind and I appreciate your comments and for stopping by. I love seeing what you cook up - it's always so seasonal and healthy. For some reason, I kept seeing Chocolate cake, all day…and your is irresistible on! Many congratulations for celebrating 5 years of blogging. You are doing great and I love your blog. Seeing chocolate cake all day sounds like a good day, Bal. Thank you for visiting here when you can. I hope you keep on blogging and sharing your wonderful gluten free recipes. I always learn about new ingredients and recipes that I didn't know before. Sorry for my belated reply, dear Monica! I haven't checked my blog during my holiday. What a beautiful cake I'm a big fan of your recipes. So wish you plenty of 5 years in your fab blog ;-)))) You are really a fabulous baker. Not at all. Thanks for finding me and for your kind words. Much appreciated. Monica - you are so nice to continue to come by here and visit with me when you get a chance. I love hearing from you and thank you for all your lovely, thoughtful and kind comments! I am wishing you the best with all your school work and sending you wishes for lots of joy outside of all the hard work! Keep baking and sharing with us! Thank you! Happy 5 years to you! It helps to have a supportive partner - I also have a husband who happily eats whatever I make, and that make the task of hunting for new recipes much easier! Yes, it is absolutely wonderful motivation to have a family to cook for. My hubby is a great eater and I'm very glad for it. : ) Thanks, Beth. 5 years!!!! WOW!!! Big Congratulations to you my dear. I absolutely loved reading your post today. I've really enjoyed visiting your space and absolutely loved each and every recipe of yours. Filled with warmth and love, you ooze loveliness. I adore your baking skills and your family is a lucky one. Your hubby sounds like such a sweet person. Wow! 5 years! Happy bloggiversary to you, Monica. Love your blog and loved reading your post today. It really nice to have a supporting partner. Love all your posts and this one sure sounds perfect for celebration. This torte is everything I want to have right now! The torte is beautiful...and I love the bits of the crunchy on it. What a luscious and elegant cake! What a beautiful cake for a special anniversary! 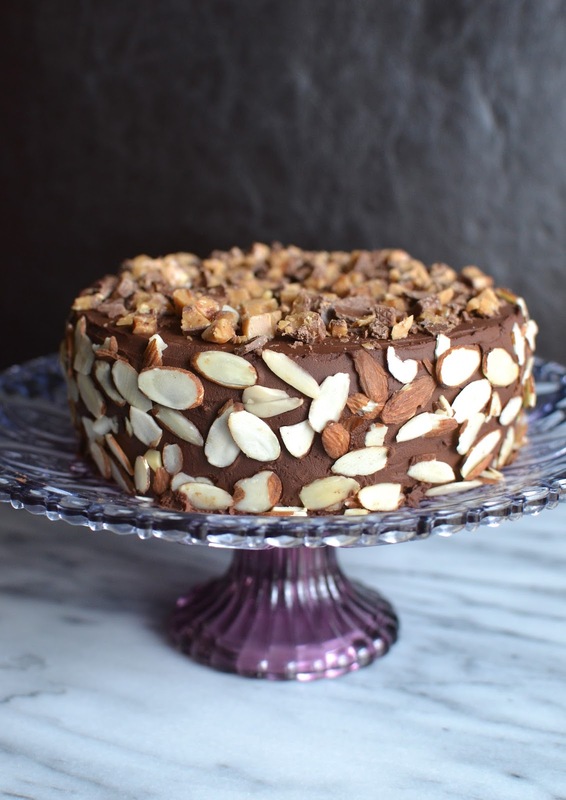 This chocolate almond torte looks absolutely scrumptious! And your photos are fantastic! I wasn't sure what to make but this turned out nice and we ate it up quickly. Thank you! Congratulations! Five years - amazing!! The torte looks wonderful, I can imagine how good it tastes! I know! Where does the time go...I'm glad to have found your blog recently, Adina. You are such a great cook! I know! And still so much I need and would love to learn! That makes it a fun journey. Thank you, Ashley. I will write more (via email) soon...just got back from vacation (the little one was on spring break from school) and I'm still setting back in (and doing lots of home cooking). I am so excited about your upcoming trip to NYC!! I know you and your family will have a great time...you pretty much can't go wrong going anywhere you've read about. I always feel so lucky to be so close to NYC. Anyway, will write more in a follow-up separately. Thanks again! Quite an adorable wedding anniversary cake! You really did a fantastic job with this cake. I love making cakes and did a three tier cake for my sister on her wedding. She got married at one of iconic wedding venues. Everyone loved entire ceremony and cake.